19 Do we need interwikis? Can anyone please restore (undelete) these? These should be small W2, WA, and WWP icons that can be used inside templates so that I can simplify some template codes. I don't know. It's still quite different from the 2nd generation... gameplay seems closer to the 3rd 2D generation overall. In keeping with the theme of the second-generation, the first-generation has the game icons next to the names. Unfortunately as the icons were sourced from the Amiga versions - WormsDC being an Amiga exclusive and the Amiga version of Worms being the only version that had an icon - they don't quite look the right shape. I propose we replace them. The Worms icon could be replaced with the grenade from the logo while the WormsDC icon could be replaced with the clapperboard from the game HUD. So you might want to go around and purge any links to it if you haven't already done so. Feel free to look through the scheme guides and copy/paste any info into your existing articles. 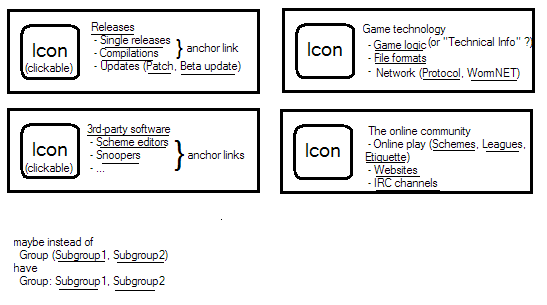 The Team17 guide is perhaps a bit too long, but I'd hate to see it lost (I'm rather fond of that one ;)) so it might be best to stick that into a sub-page or something, depending on what your content conventions are. I'll put it in my userspace for the time being. There are probably a few stray links on the Team17 forums that could also do with removing. I know the Worms Unlimited section has a lot of this already, but what I'm talking about would have much more content than that. My idea is that a "Custom Worms Weapons/Utilities" section be created, and instead of people submitting their custom worms item by only giving a description, they could also add an icon, damage readings, and other specific things. So, why not just add an infobox for subpages under Weapons (Worms Unlimited)? We already have a "detailed description" and "commenting" using the subpages and talk pages. It's a maintenance nightmare. I'd have to maintain X more domain names and wikis / wiki databases. The *.worms2d.info namespace is already used by Worms-related projects and community websites. Colluding them with WKB translations would create confusion and risk collisions. If you pick a consistent naming convention (I see some people disregard existing conventions and just use the translated name), I can look into setting something up to automatically change the interface language appropriately.